Authors Talk ~ Join us for a conversation with Author Stephen Palumbi, Professor, Hopkins Marine Station, Stanford University, Author Carolyn Sotka, Professor of Marine Biology, College of Charleston, and Mark Carr, Professor of Biology, Dept. of Ecology and Evolutionary Biology, UC Santa Cruz, as they discuss the fascinating history of Monterey Bay and the people who have had an impact on its inhabitants, both human and marine. Co-sponsored by Save Our Shores. Introduction by Nicole Crane, Cabrillo College Marine Biology and Environmental Sciences. The Rio del Mar Improvement Association along with Save Our Shores is sponsoring a beach clean up at Hidden Beach in Aptos on July 5, between 9 and 11 A.M. Supplies and sign ups at Hidden Beach Park picnic tables and supplies to use will be given out. You can bring a group or family along and help keep our beaches clean and safe! School children can earn community service credit as well. As many folks know, Hidden Beach is a very popular spot for the 4th of July celebrations, and the beach will be sure to be littered with trash and debris from the celebrations the day before. 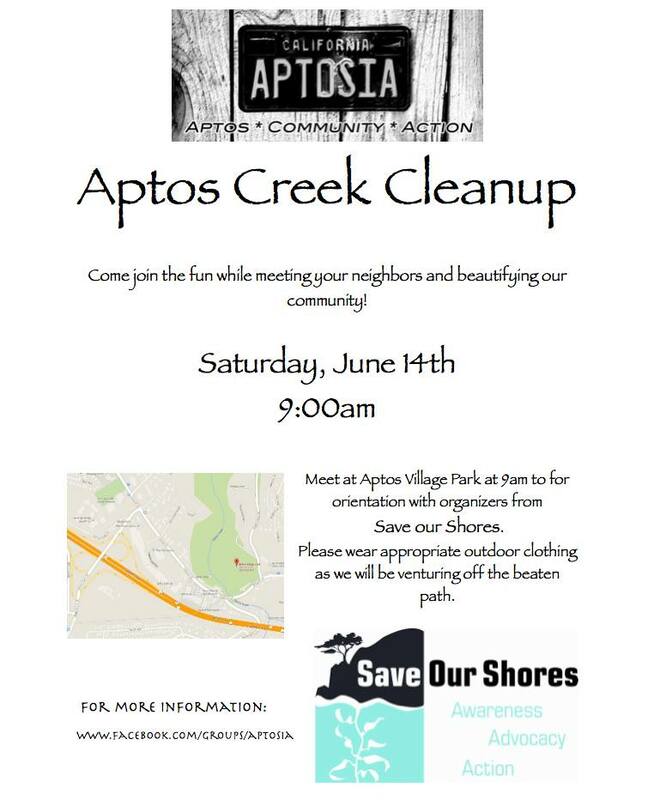 Please come out and help keep this lovely Aptos beach clean! If you have questions, contact fayjoe1@yahoo.com for more information. Thank you so much for your participation and support! Spring is in full swing, and a couple of our area’s neighborhood associations are asking you to help clean up Aptos this week. The first clean up, sponsored by the Rio del Mar Improvement Association, in concert with Save Our Shores, happens on Wednesday, May 13th at Hidden Beach. Volunteers are asked to check in at the Hidden Beach Park picnic benches. The cleanup is from 9 AM until 11 AM. Individual and small group volunteers are welcome. Save Our Shores provides all necessary supplies, and volunteers are encouraged to bring their own reusable buckets, gloves, and water bottles. Please contact cleanup@saveourshores.org for more information. The next cleanup is sponsored by the Seacliff Improvement Association, Saturday, May 16 between 10:00am-11:00am. Volunteers will meet in the little parking lot in front of the Forget Me Not shop. This clean up will focus on maintaining the Seacliff Village area, primarily around the merchant shops and the Seacliff State Beach entrance. Volunteers are asked to come and bring pickers, pruners, shears, weedwhackers, and garden gloves. Bags to haul away trash and trimmings will be provided. The good folks at the Rio Del Mar Improvement Association are organizing a Hidden Beach cleanup set for February 13, at 9:00 AM. The cleanup is being done in association with Save Our Shores. Volunteers are to meet at the picnic tables at Hidden Beach Park to sign in and get supplies. Rain will cancel the cleanup – so let’s hope it gets canceled! (just kidding). Please email Fay Levinson at fayjoe1@yahoo.com for more information. Various Aptos neighborhood groups organize beach clean-ups throughout the year, and it’s one big reason that the Aptos beaches are relatively litter-free. While many argue that it’s the government’s job to keep the beaches clean (as they are public places), the reality of constrained budgets for both state and county parks mean that local volunteers are needed to help keep our beaches beautiful. A group of Aptos Residents (organizing via the Take Back Aptos group on Facebook) is planning to get together to clean up Aptos Creek on Saturday, May 3 at 10:30 AM. Save Our Shores has agreed to provide some tools and supplies for the clean-up, but volunteers are encouraged to bring gloves and buckets just in case. The plan is to meet at Aptos Village Park and get going from there. Bring your wading boots!